The start to competitive football in season two hasn’t been positive. We’ve struggled for consistency and really struggled to create meaningful goalscoring chances. At the time of starting to write this post, at the end of October 2019 in-game, we’re languishing in the bottom half of the league on nine points from eight matches. In season one, the vast majority of our play came down the flanks. Our wing backs seemed to always be open and had all the time in the world to pick their spot in the penalty area, despite our cross completion not being amongst the best in the league. So far this season we seem to have been “found out”. We’re too one dimensional. With us attempting 80 crosses in a recent defeat away to Midtjylland in the Europa League a prime example. It’s time to take a look at what was wrong, and try to stop the rot. After the last tactical tweak, when I moved an extra man up front, this is how it looked. I couldn’t settle on any of the roles for that midfield trio at all and so much of our play was geared down mainly the left hand side. That Midtjylland match is the one I’ll be looking at when outlining why we needed a change. FCM also set up in a formation with wing backs, but theirs only attempted a grand total of 11 crosses. That’s even with what looked like two inside forwards cutting inside and creating the space out wide for them to bomb on. Both Soares and García attempted 34 crosses each of our overall 80. Don’t get me wrong, I love a cross. As I always say when I get asked in press conferences, if we keep getting the ball into the box there’s a good chance we’ll connect with at least one of them. But this just looks a little bit ridiculous, doesn’t it? Despite moving to two up front to give our crossers more options to aim at in the centre, quite often it was still just that AF waiting in the middle. The DLF(S) and AM(A) couldn’t get into the area to support quick enough, especially with crosses from the left hand side, as you can see by the screenshot below. We’re chasing the game in this screenshot, 3-1 down in the 90th minute, but it illustrates probably an error on my part. #19 has just sprayed a long ball out to Soares in the WB(A) role. He’s got acres of space to run into and gets into a great position to cross the ball, getting ahead of FCM’s right back. All he’s got to aim at is our AF. #9 is our DLF(S), who the play just seems to have totally passed by. #19 and #22 are our AM(S) and BBM, while #2 is the RWB(S). FCM easily deal with the cross and it’s cleared. This happened time and time again, not just throughout this match. Maybe I’m expecting too much here. Maybe I’ve just completely got it wrong tactically, but I would expect a lot more of our play to come through the centre. Here’s our touches and heat map, again from that FCM match. So much of the play was skewed down that left hand side with the LWB combining with our DLP in the defensive third and then likely with the DLF/AM in the attacking third. Our central midfield pairing played a combined 141 passes between them, only three of these were key, and only one of them was into the box. 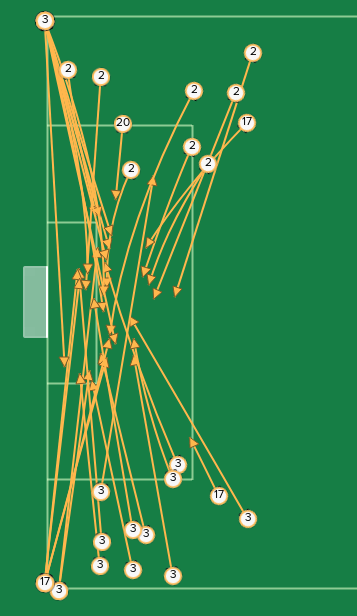 The players playing in the AM role during the match played 48 passes, with none of these going into the box. Our strikers only received the ball to their feet in the FCM box a handful of times throughout the match. I feel disappointed that I’ve already strayed away from my initial tactical idea, but it just wasn’t working. Did I give up too quickly? Maybe, but I felt the change needed to happen. It’s still there to potentially move back to and work on some more, but here’s how it looks now. It’s a brand new approach. I’d never been a fan of a three man central defence until the previous tactic, always preferring a more familiar to me four at the back. This is a return to that. Rafa Soares on the left hand side still gets up to support attacks but his influence on our overall attacking play is taken down a couple of notches. Wakaso in that DLP(D) role actually does drop in to form a three centrally quite often, but mainly to show for the ball from the keeper or the two CBs. The right sided full back is on a support duty to provide more defensive solidity, but with that DLP dropping in, there is occasionally licence to switch that role to a wing back and/or duty to attacking. The current central midfield pairing is just that, two central midfielders. The right hand side is on attack, with the left on support. 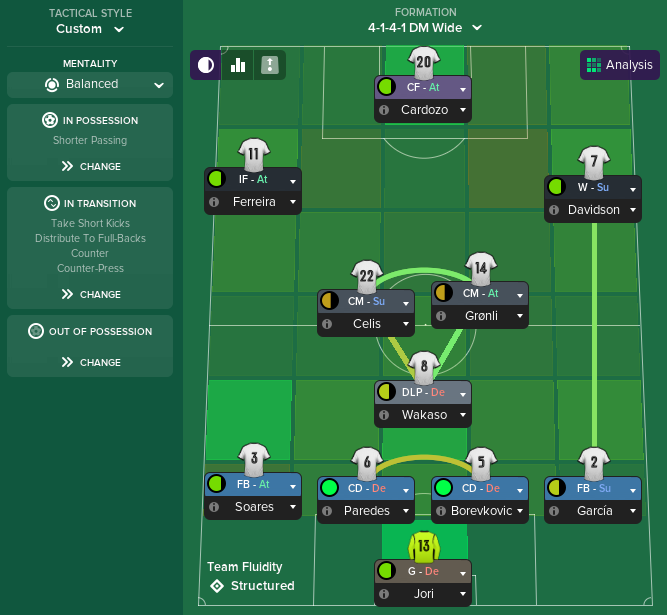 The CM(A) was one of my favourite roles on FM18 as part of my 4-4-2, so I’m keen to see how well it gets up to support our attacking players. The CM(S) is in there to provide balance to the side and support at either end of the pitch. The roles aren’t set in stone yet, but early indications are okay. The attacking trio is an IF(A), W(S) and CF(A). The inside forward has been an important part of the turnaround so far, which I’ll go into in a second, while those latter two roles are still up for debate. The winger on support has a few subtle differences to the winger on attack, the starting position being one of them. While I feel we do have the players behind the role to be able to cover it being on an attack duty, it starting on support sees the link up being much easier with the players supporting the role, mainly the CM(A) and FB(S) behind him. I do love a winger bombing on and crossing it from the byline but I want to leave it up to the player to make the right decision on what’s needed in the moment. Right now I’m still a bit unconvinced by my CF but looking at the role description it’s exactly what I want so I’m sticking with it. I want him to link play like a DLF, I want him to be our spearhead like a poacher and I want him to hold it up like a target man. Too often in season one in the previous tactic our main striker just seemed to be a decoy to occupy opposition defenders. Maybe I’m being greedy that I also want my striker to be doing that too alongside all those other qualities. The use of wide players further up the pitch now stretches the backline of our opposition, whereas before they seemed willing to concede the wide areas to our wing backs bombing on. It was originally on support duty, but as pointed out by FMPressure on my channel on FMSlack, who would be well positioned to get up to support the lone striker if the IF wasn’t on attack? The switch has been a key one so far. Despite losing 4-2 against them earlier on this season, from a winning position no less, across November we managed to beat Maritimo twice, scoring eight and conceding two. When Luiz Phellype wins and brings down a long kick out from our keeper, drawing out one of Maritimo’s CBs in the process, there’s only one thing on Arabidze’s mind as our IF on attack. He doesn’t stay out wide, he drives into that open space in behind his opposing full back. This draws the second CB over and Davidson, our winger on support, has an easy tap in at the back post to round off a 5-2 Taca de Portugal 4th round win. We’d only kept two clean sheets between August and October. We kept three in November alone, including two excellent 1-0 victories in the Europa League against PAOK and the return match against Midtjylland. From conceding three goals against them in Denmark to only allowing them four shots on goal in total just a few weeks later. Here’s how. 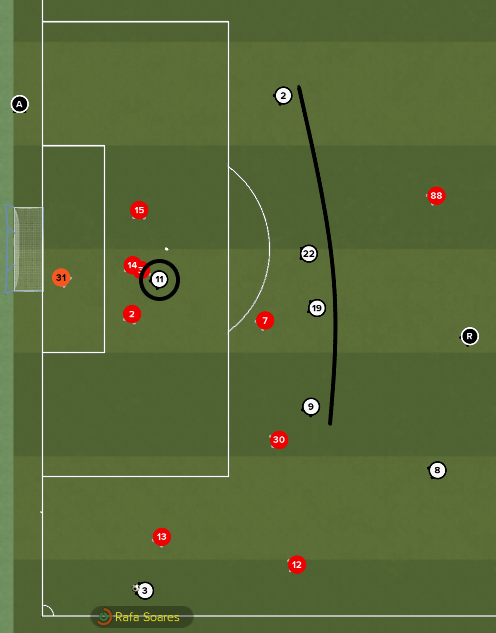 Counter-pressing was part of our previous tactic too, but teams found it easier to attack us with no players immediately engaging their oncoming full backs. The introduction of our advanced wide men stops that now, and FCM’s wing backs and central midfield pairing struggled to get into the match. Their wing backs, specifically, had pass completion percentages of 55% and 52% as we pressured them into making rushed passes or long clearances which were easily dealt with. Another bit of a difference can be seen below. Before, our wing backs were pushed much higher up, so we basically only had a defensive base of the back three. Now I’d say we’ve got a defensive base of five. Mabil has made what the game classes as a “dribble”, running from well inside his own half with the ball at his feet. He’s evaded the attempted tackle from our DLP #8 who’d been tracking him, and it looks as though it’s just a simple cross into the box for their #19 to score. Luckily, my RB #2 is covering and manages to block the cross. We drastically outnumber FCM, with six back there up against their three most advanced players. André André has arguably been our talisman so far this season. Prior to the tactical switch my captain had scored six goals, albeit three of those were penalties and another was a rebound from a missed penalty. However from switching things up a bit in the hunt for results, Sigurd Grønli has emerged as a contender for the CM(A) slot. The 19-year-old Norwegian scored the below equaliser against Boavista and is a set piece magician too which just adds an extra threat for us. Previously I’d been shoehorning natural wide players into roles behind or as strikers. Mário Ferreira is another who’s going to benefit from the tactical switch, moving out to the left hand side and being unleashed in his natural inside forward role. He scored the winning goal in that 1-0 win over Midtjylland with some classic inside forward play. 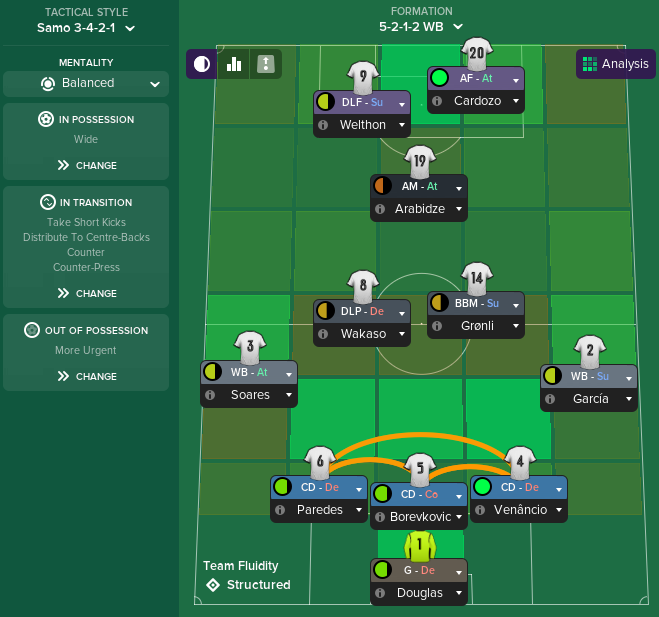 I’m trying to be much more fluid tactically on FM19, but I didn’t expect to be shifting my entire system around this early on in my save. Results are certainly much more positive since the change though. Things are looking up for the rest of my second season with Vitória. If you’ve got any other pointers you want to share about my tactic or if you fancy giving it a shot yourself then just let me know in the comments or on Twitter. Thanks for reading, as ever. If you want to join #FMSlack to join in with even more FM chat you can do so by clicking here. I update my save in real time when I’m playing on my channel in there. I’m on the One More Game Podcast every week, and if you want to listen to that you can click here. Subscribing, following us on Twitter and sharing the pod would be much appreciated. Lovely post, as always. Nice and simple. Using all the basic roles, same as me (but I’m using a 4-2-3-1) I had the same issues with a CF – At that you’re having and I wasn’t convinced, then I switched to a Poacher as I wanted my striker to make more runs forward and he suddenly started scoring more. I’d rather use a CF – At and ultimately I’m going to try change the system to use it, but I find it harder to get more out of the role than previous versions. It wouldn’t be me if it wasn’t nice and simple! Really don’t like overcomplicated tactics at all. I’m still unconvinced by a lot of the movement in the final third, I feel like a lot of it at the moment is me getting lucky rather than specifically down to my tactic/player roles. It’s fits and starts from my CF rather than a hot streak of form.